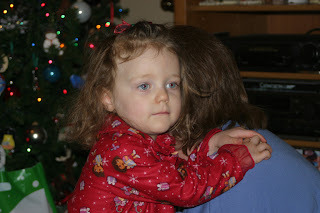 Here are some pictures from Our Very Merry Christmas. 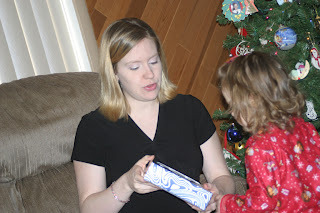 MJ enjoyed opening her presents and wanted to play with every present right when she opened it...so this slowed things down a little, but we just took our time and let her open the next present as she was ready. As she opened her new presents, it was great to see her face light up with excitement and to hear her say in her sweet voice, "Thank you Mommy and Daddy, Thank you." She said Thank you to everyone who gave her a present. She is a sweet girl for sure. 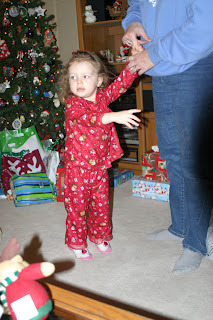 She is wearing her Christmas Eve present from Mommom and Pappy...a pair of Red Flannel Dora pj's. 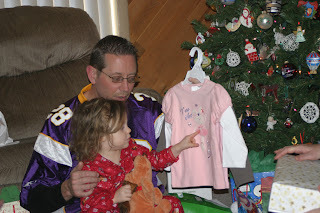 In the picture with Pappy, she just opened a shirt from Mommom and Pappy that says, "I'm a Big Sister." All in all, we had a great day with family celebrating the birth of our Savior, Jesus. How I LOVE these happy pictures! I am sooo glad that you all had a wonderful Christmas together. What a great New Year it will be for you...a brand new little sister for Michaela. Now, that is the best gift of all. We are counting down the days with you! These pictures are beautiful. I am so glad that you enjoyed every moment of your Christmas with the best gift of all -- family! We send you lots of love & the very best wishes for the exciting new year ahead for your family!